Ugreen is offering our readers a discount on the little brother to the dock we reviewed, this one doesn’t have the USB charging but it’s basically the same otherwise. Just a few weeks ago, we reviewed the Ugreen Apple Watch charging dock with extra USB ports and we loved it. While the design isn’t much to write home about, the fact that this charging dock has an integrated Apple puck is what makes it. Now Ugreen is offering our readers a special discount on the little brother to the dock we reviewed, this one does not have the USB charging out but it’s basically the same charging dock. 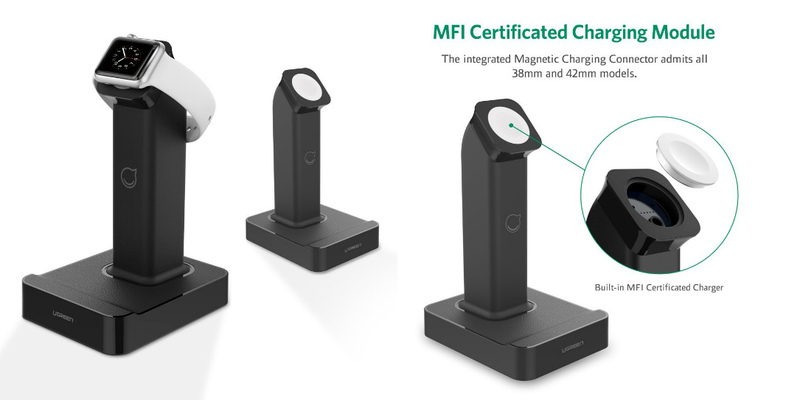 Inductive Charging: compared with other charger stands in market, it is not only a stand, but with built-in integrated magnetic charging module for Apple Watch. The magnets align the connectors automatically, and then inductive charging begins instantly. No need to plug in an extra magnetic charger cable anymore. It is specially designed for Apple Watch, Apple Watch Sport, Apple Watch Edition. MFi certified, PPID 219693-0019. Hold Securely at Viewable Angle: this charger dock securely displays and charges your Apple Watch vertically or horizontally at a viewable angle, and also make sliding the watch on and off the charging connector easy. It is an ideal choice for your watch at home or office whenever it’s not on your wrist. With 4ft/ 1.2m USB cable, it enables you to place this charge dock at a desired place from the USB charger(not included), like desktop, tabletop, or bedside table. 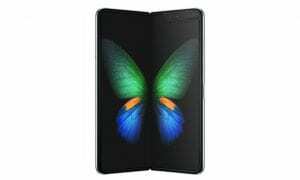 Molded Base for placing your Smartphones Firmly: the anti-slip leather mat on the base and stand can hold your iPhone and Android smartphones at a comfortable angle. Right now the MFi certified Ugreen Charging Dock for Apple Watch is $45.99 on Amazon but if you use the code CDAB89AE at checkout, you will get $10 off the Amazon price just for our readers. The extra USB ports on the larger version are handy but all in all, this is a pretty good deal. You’ll want to act fast though, this code is only good through 1/13/2017.